Paris Orthopedics and Sports Medicine offers joint replacement for patients who are experiencing joint pain, immobility, and improper joint function as a result of disease, stress, or age. Through the use of state-of-the-art technology, our team performs joint replacement for knee, hip, and shoulder conditions. This surgical procedure is often recommended for patients who are unable to perform everyday tasks, such as sleeping, without difficulty and pain. At times, before your provider will recommend a joint replacement, they may first try reduce symptoms using a non-surgical method. In cases where these conservative methods prove ineffective, or in the case there your condition warrants surgery, your provider will discuss your surgical options with you. Paris Orthopedics offers both minimally-invasive and open surgery options. Minimally-Invasive Procedures; When possible, the providers at Paris Orthopedic prefer to use minimally-invasive joint replacement procedures. Minimally-invasive joint replacement procedures include joint realignment, ligament reconstruction, and arthroscopy, which are performed through tiny incisions.The benefits of minimally-invasive surgery include a quicker and easier recovery, in most cases. Through the use of advanced techniques and tools, most minimally invasive surgeries are able to be performed as outpatient procedures, meaning you get to go home the same day. 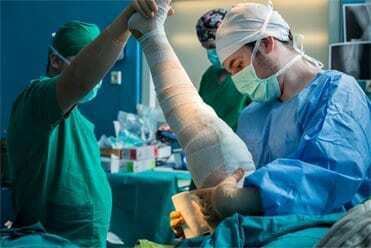 Open Surgical Procedures: In certain cases, your provider may recommend an open surgical procedure for your joint replacement. If this is the case, you can rest easy knowing you are in good hands. Our surgeons goal is to restore the joint function and improve mobility and they always have your best interests in mind. If you have been experiencing joint pain, it is wise to be evaluated by a professional. Our providers will identify and diagnose the source of your pain and recommend proper treatment options. If you are ready to say goodbye to joint pain once and for all, schedule an appointment with Paris Orthopedics and Sports Medicine today. Our providers look forward to alleviating your pain and increasing your quality of life. Contact us today to learn more.